'Silk Road' develops a large flower, actually about average for an Orienpet, with a white base color that deepens to near crimson pink in the flower centers and just a kiss of yellow at the very center. Mature plants will produce secondary buds for extended bloom. Unlike some of the dutch catalogs that talk about re-bloomers, there are none in the lily world as there are with daylilies, but still, mature plants will often give you a full month of flowering pleasure in the garden. Can reach 6 feet or more when happy and being fed, expect a more modest 3 to 4 feet in the second year of planting. Mid to Late July Flowering. Fragrant. 'Silk Road', is another lily with a controversial history. 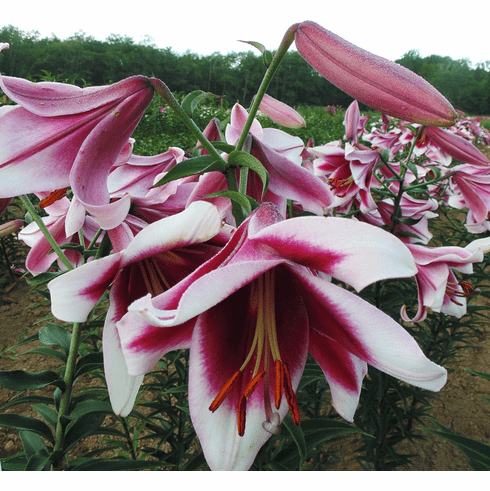 We believe this lily was actually bred in Canada by Wilbert Ronald and Lynn Collicut while working at the Mordon Research Facility in Manitoba. For years, debate has raged among members of the North American Lily Society including discussions on how to do genetic testing to prove who it really belongs to. Much like 'Scheherazade' bred by our dear friend, the late LeVern Frieman, that debate was finally set to rest with the book by the late Edward McRae attesting to the fact that LeVern indeed was the breeder of 'Scheherazade'. Someday, hopefully, the 'Silk Road' debate will also be put to rest as well.